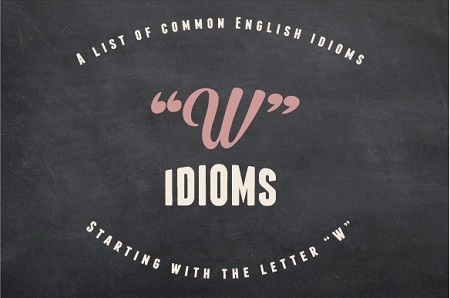 Check out this W idioms list. 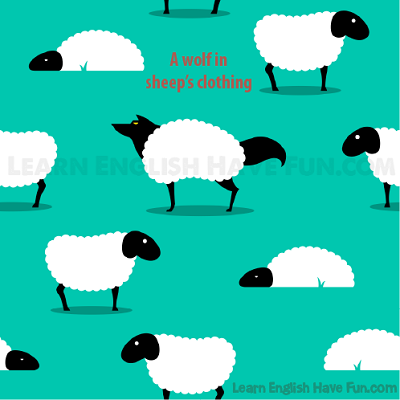 Do idioms “drive you up the WALL?” Learners usually “WARM up to idioms” very quickly when they discover they only need to understand them rather than use them often in their own speaking and writing. That's right! You can speak English at a very high level without using a lot of idioms yourself. In the beginning, focus on noticing them and understanding them. Later you can incorporate them into your own speaking when you feel more comfortable. Or not at all. You can express the same meaning with other words. Before we get started, you hopefully remember what an idiom is, right? wade through something: 1) to read a large volume of material or detailed information; 2) to pass through a large group of people. We’ve got to wade through 650 job applications we received for the program manager vacancy. My friends were right in front of the stage at the concert and I tried to join them but I couldn’t wade through all the people. (fall) off the wagon: drinking alcohol again after having stopped space (this term is usually used for people who have a problem with alcohol). Sadly, my father fell off the wagon and we’re trying to persuade him to go back to rehab. Your office called to see if something happened because you didn’t go to work today — are you off the wagon again? on the wagon: not drinking after having been drinking regularly (this term is generally used for people who have problems with alcohol). We’re all relieved my son is finally on the wagon and hope he can stay on it. I’m back on the wagon after getting arrested for drunk driving — it helped me finally realize I have a serious problem. wait and see: to wait over a period of time for news or results about something. I’ve submitted my novel to 20 publishers and now all I can do is wait and see. Just wait and see — you’re going to love your job in a few weeks when you get used to it. wait on someone: to serve someone. When my kids became teenagers I stopped waiting on them and they quickly learned how to help themselves. wait out something (wait something out): to let time pass until something happens or ends. The authorities have ordered all residents to evacuate — no one is allowed to wait the storm out. I’ve tried to wait out the thunderstorm but after 20 minutes I had no choice but to run to my car and I got soaking wet. There’s nothing the doctor can do — it’s the flu and I’ve just got to rest and wait it out. wait on someone hand and foot: to do many different things to serve someone. After my mom had a stroke she needed someone to wait on her hand and foot. Women who earn money usually are not trapped at home having to wait on their husbands hand and foot. wait tables: to serve customers as a waiter/waitress in a restaurant. Waiting tables is a popular job for students and artists. I really don’t recommend waiting tables — I seriously injured my back carrying heavy trays of food when I was a waiter. in the wake of something: happening after or as a result of something. In the wake of rioting after championship games, the police have increased security for the Super Bowl. My mother has been living with us in the wake of my father’s death. wake up to something: to become aware and understand something important. One day you’re going to wake up to the fact that you’re worrying about your daughter doesn’t help her but it does hurt you. When he really wakes up to understanding how much he hurt us then maybe I’ll give him a second chance. take a walk: to leave, go away. When the customer wouldn’t stop yelling, my manager told him to take a walk or he’d call the police. I’d rather take a walk than stay in an abusive relationship. walk all over someone / something: to treat someone badly and without respect. My sister let her kids walk all over her for years but she’s finally saying “no” to them. Say something! Don’t let your roommate walk all over you. walk off with something: to leave with something that you didn’t have permission to take. I had a party Saturday night and someone walked off with my mom’s gold bracelet. Rats! That customer just walked off with my pen. walk out on someone / something: to suddenly end or abandon a relationship. The cleaning staff walked out on their jobs during our stay so our hotel room was only cleaned once all week. My sister was so scared of her boyfriend she just walked out on him, only taking a few clothes with her. walk the walk: to show something by your actions (and not just by your words). We always give the applicants a writing test to make sure they can walk the walk. He was an excellent player in high school but he never walked the walk in college. walk (someone) through something: to explain step-by-step or in detail how to do something. Sorry but I’m terrible with computers — can you walk me through installation and activation? On your first day we’ll walk you through how to open and close the store. walk on eggshells: to be extremely careful around someone in order not to upset them. drive someone up the wall: to really bother or annoy someone. My secretary pops her chewing gum loudly all day long and it absolutely drives me up the wall. Please don’t play your music so loud, you know that drives your father up the wall. off the wall: strange or unusual. You’ve got to see how she decorated her apartment — it’s really off the wall. a fly on the wall: to be able to secretly hear and observe something. My manager just got called into the director’s office — oh, how I’d love to be a fly on the wall! I’d like to be a fly on the wall when the committee reviews our applications. (with) one’s back against the wall: in a difficult situation without many options. I wish I could help you, but my back is against the wall because I don’t get paid for two more weeks. After failing three quizzes, my back is against the wall and I’ve got to pass all of the rest of them. want for something: to not have something you need. My parents were poor but we never wanted for love. When I volunteered in Africa I realized I really didn’t want for anything. ward off someone / something (ward someone / something off): to try to keep someone / something harmful away. We keep the lights on our porch at night to ward off burglars. This ointment is fantastic for warding off mosquitoes. warm up to (someone / something): to begin to like someone / something. My mother is so afraid of everything she’s just beginning to warm up to using the microwave. Since our baby was born my father is finally starting to warm up to my husband. 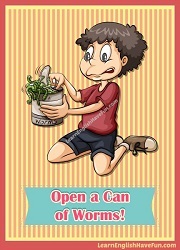 warts and all: including bad qualities, habits, etc. My son is a slob but I love him warts and all. The key to a successful marriage is excepting your spouse warts and all. wash down something (wash something down): to drink a liquid to help swallow something. Could I have a glass of water so I can wash down these pills? We washed down my birthday cake with a bottle of champagne. wash out (something) (wash something out): to cancel an event because of rain. Sadly, we went all the way to Paris for the French Open but the matches were washed out the day we had tickets. Let’s have the picnic in July so it won’t get washed out this year. wash up: to wash or clean your hands. I’m shocked at how many people don’t wash up before eating at restaurants. Kids please turn off the TV and wash up for dinner. go to waste: to not be used. When the Native American Indians killed a buffalo absolutely nothing went to waste. Since we moved into an apartment and have a small refrigerator we can’t buy a lot of food, so now nothing goes to waste. waste away: to slowly become thin and weak. After my grandma died, my grandfather didn’t want to eat and began to waste away. After I got cancer I started wasting away until I began drinking these high-calorie nutritious shakes. waste one’s breath: to say something that will probably be ignored. You could tell her that her hairstyle looks ridiculous but you’d just be wasting your breath. I don’t waste my breath asking my kids to get off the Internet — instead I just disconnect it each night at 8 PM. keep a close watch on / over someone / something: to carefully follow or protect someone / something. Could you please water my plants and keep a close watch on my house while I am away? Something is strange — I’m going to keep a close watch over my 13-year-old from now on. watch out: be aware and careful. Watch out for that bucket of water behind you — I don’t want you to fall over it. Whenever we drive though this wooded area I have to watch out for animals running into the road. watch out for someone / something: 1) to carefully be aware in order to avoid a problem; 2) to look carefully to try to make sure someone else is safe and okay. Our older brother always watches out for us at school to make sure no one bothers us. Watch out for pickpockets, especially when you travel near train stations. watch over someone / something: protect someone / something by being alert for any problems or danger. Could you watch over my backpack while I run to the bathroom? I prefer to live in a gated community with security guards watching over us. Even though I'm working two different jobs it's hard for me to keep my head above water. During the holiday season it is really difficult for us to keep our heads above water with all of the last-minute orders and inquiries. in hot water: to be in a difficult situation for doing something wrong. I’m in hot water for skipping classes this morning. You’ll be in hot water if anyone notices you’re watching movies at work. not hold water: to not seem true or reasonable. Your excuse that you didn’t get my email does not hold water because Julie said your forwarded it to her. This weak apology is not going to hold water with our customers. water down something (water something down): to make something weaker. We stopped going to that bar because they were watering down their cocktails. Our legal department said we need to water the statement down or risk getting sued. water under the bridge: it’s not possible to change something that’s already happened. I wish I hadn’t sold the watch my father gave me but now it’s water under the bridge. We both said terrible things but it’s water under the bridge — let’s learn from this and move on. muddy the waters: to make things more complicated or confusing. Wait a while — if you release another statement now you’ll only muddy the waters. Unfortunately, the results of this new survey really muddy the waters. test the waters: to try something new (especially to see what will happen or how others will react). I’m testing the waters to see if having a photo on my CV makes any difference. Before you quit your job and start a consulting business I recommend you test the waters with one or two clients. on the same wavelength: agreeing or having the same opinion. My business partner and I were on the same wavelength when we first started but now we have very different ideas about the company. Amazingly, we were all on the same wavelength at today’s meeting. make waves: to shock or upset people by doing something different. After Madonna and Lady Gaga, it’s pretty hard to make waves in music anymore. When you go overseas next semester try not to make waves — the world is a dangerous place these days. bluff one’s way: to pretend to be something you are not to achieve something. I forgot to bring my ID but I was able to bluff my way past security. I’ve bluffed my way through the interview but I’m going to get fired because I don’t have the skills to do this job. by the way: an expression used in a conversation to indicate there is some additional information you want to say. By the way, did you hear that my sister will be home for the holidays? I really love your new haircut by the way. clear the way (for someone / something): to do something that makes it easier for something else to follow. When the Civil Rights Act was passed it cleared the way for all minorities to get better jobs and education. Whenever a woman breaks into the top level of any field it clears the way for others to follow. either way: whatever happens (no matter which option you decide). Both dresses are beautiful so either way you look great. We haven’t decided where we will stay yet but either way we're definitely going to the beach this weekend. every which way: in many different directions. When the fire broke out the restaurant diners ran every which way, injuring several people. We drove every which way and still couldn’t find the party so finally we gave up and went to a movie instead. When we arrived in Doha there was a window of opportunity to get on an earlier flight to Singapore but we couldn't get to the gate fast enough. Over the next few months before you go to Europe watch for windows of opportunity to buy euros when the exchange rate drops. After my best friend at work stole my idea and got a promotion, I'm always careful to make sure the people around me are not wolves in sheep's clothing. I learned those tiny packets of chips with only 100 calories were just wolves in sheep's clothing—the companies that make them know you'll always eat more than one! three little words: these three short words are "I love you." Finally, I was just about to say those three little words to my boyfriend when he told me he thought it would be better if we were just friends. My boyfriend keeps complaining that I never say those three little words but they are big words to me! I like him a lot but I just don't fall in love very easily. I feel like bringing my girlfriend home for the holidays might open a can of worms but she really wants to go. The audit opened a can of worms revealing corruption, bribery and nepotism at the nonprofit organization. Have you signed-up for my free newsletter? I include an audio magazine article every month that's got lots of new vocabulary and idioms. 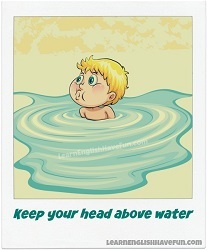 You can also find many idiom definitions one of the online learner's dictionaries. The best way to make sure that you truly understand an idiom is use them in your own sentences. You don't need to worry about using them in your own speech but if you practice creating sentences here you can really make sure you understand the meaning. I will correct any mistakes. Simply choose one or several W idioms from the list and create your own sentences in the comments box below.